CAMBRIDGE — A road trip can be an adventure, a journey of self-discovery, a rescue mission — or, as in the case of “Miss You Like Hell,’’ all three. Like it or not, and I suspect its creators like it just fine, “Miss You Like Hell’’ is also a political statement, from its focus on the plight of an undocumented Mexican-American immigrant who is facing possible deportation to its utilization of the stark symbolism of a border wall. 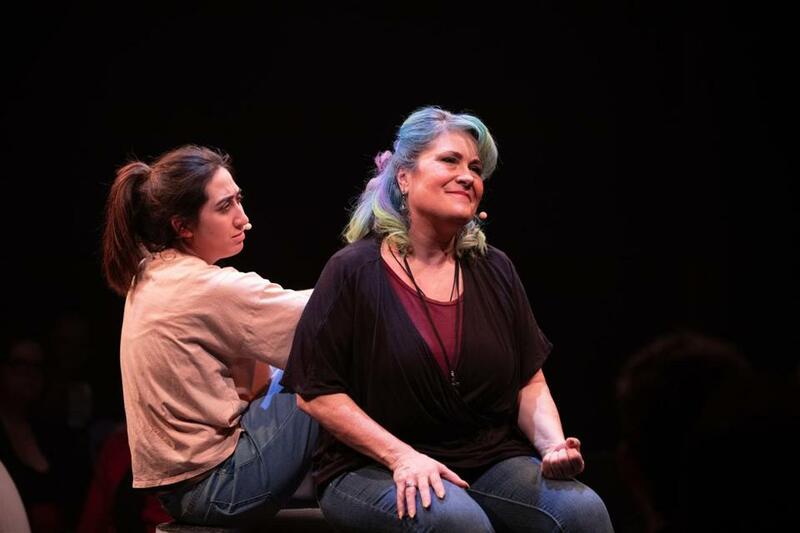 Now receiving its New England premiere at Oberon in a collaboration between small Company One Theatre and large American Repertory Theater, “Miss You Like Hell’’ adds up to a mixed bag. There are narrative detours that yank us out of the story just as we’re getting to know and care about the loving but tense mother-daughter relationship at the show’s center. But I nonetheless count more pluses than minuses in this impassioned musical, which features a pulsing score, performed by an energetic seven-piece band, and is directed with equal vigor by Summer L. Williams. The handiwork of Quiara Alegría Hudes (book and lyrics), who won a Pulitzer for “Water by the Spoonful’’ and wrote the book for “In the Heights,’’ and Erin McKeown (music and lyrics), “Miss You Like Hell’’ has a timely tale to tell and a compelling reason to exist. After all, you could argue that Donald Trump has spent more time and energy demonizing Latino immigrants than on any other task during his presidency, with the possible exception of working on his golf game. The theater world has been pushing back by making use of its own bully pulpit to champion immigrants and generally align itself with “the resistance,’’ and not just in “Hamilton.’’ In November, for example, Guatemala-born immigrant Alex Alpharaoh performed his solo show, “WET: A DACAmented Journey,’’ at Boston’s Paramount Center. Alpharaoh immersed audiences in the day-to-day details of the precarious existence of the “Dreamers’’ brought illegally to the United States when they were children who now fear possible expulsion from the only country they have ever truly known. Similarly, with its portraits of the people on the receiving end of Trump’s calumnies, “Miss You Like Hell’’ registers as a theatrical counter-narrative, even though it was developed well before his election and is set in 2014. Nothing combats abstraction like human faces, voices, and stories. The story in “Miss You Like Hell’’ is set in motion when the undocumented Beatriz (Johanna Carlisle-Zepeda) shows up on the doorstep of her estranged 16-year-old daughter, Olivia (Krystal Hernandez). After living for years in the United States, Beatriz now faces possible deportation. She asks Olivia to travel with her across the country and testify on her behalf at an immigration hearing. Only reluctantly does Olivia agree to do so, and off they go in Beatriz’s truck. But it is a while before an answer is forthcoming to the mother’s overarching question, delivered in song: “Do I get a second chance?’’ That question, of course, applies both to Beatriz’s relationship with her daughter and with her adopted country. Along the way, Hudes and McKeown allow “Miss You Like Hell’’ to get sidetracked by a cloying subplot about a devoted elderly gay couple, Mo (Matthew Murphy) and Higgins (John O’Neil), halting the show’s momentum and diluting the focus on Olivia and Beatriz. The literary-minded, possibly suicidal Olivia writes a blog that is followed by another 16-year-old girl, Pearl (Raijene Murchison), who interacts with Olivia online and sometimes challenges her to be more honest with herself. Adrian Peguero adds a jolt of energy and some exceptional singing to the production as Manuel, a Peruvian day laborer who catches Beatriz’s roving eye as he is selling tamales. Bohemian free spirits like Beatriz are always an inch away from “Hair’’-style cliché, and though Carlisle-Zepeda gives it her all, she does not entirely avoid that pitfall. Hernandez has more success as Olivia, delivering a nicely modulated portrayal that builds persuasively from brooding alienation to active engagement, and culminates in Hernandez’s devastating performance of the title number. In that moment, the human impact of immigration policies is indelibly driven home, and it’s made very clear who, of mother and daughter, is most in need of rescue.